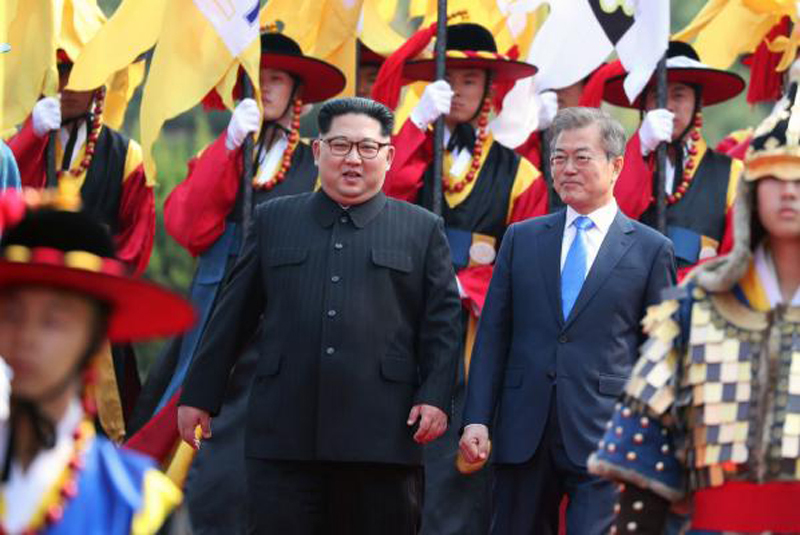 South Koreans welcomed the joint declaration from leaders of North and South to work toward an official end to the 1950-53 Korean War as ruling and opposition political parties reacted to the historic summit between Kim Jong Un and Moon Jae-in on Friday. South Koreans in central Seoul going about their daily business in one of the world's populated cities were seen stopping to watch the summit on huge outdoor LED displays, South Korean news service News 1 reported. The Panmunjom Declaration issued Friday drew applause near Seoul's City Hall. Lee Byeong-cheol, 41, said feelings of hostility between North and South "is now of the past" and that he "enthusiastically welcomes the declaration to end the war." Older South Koreans, who tend to be more wary of the North, also welcomed the move. Jang Seog-gyu, 74, told News 1 the "most important issue in a divided country is maintaining peace and coming to agreements." Jang also said the agreements to resume reunions of separated families and increased civic exchange will maintain the peace and eventually erase the division. Young South Koreans said the summit will improve relations with the North. Han Dae-yeon, 12, who was watching the summit at Seoul Station with his father, said he thinks "unification will take place naturally with exchange." "At school, we talk a lot about how the economy will improve with unification. If we unify, I want to go to Pyongyang and eat Pyongyang's cold noodles," Han said. Not all groups have welcomed the summit. South Korea's main opposition conservatives denounced the Moon-Kim meeting. Local newspaper Chosun Ilbo reported Hong Jun-pyo, a former presidential candidate of the Liberty Korea Party, derided the summit as a "peace show" in a Facebook post published Friday. "The South-North summit declaration is nothing but a transcript of what Kim Jong Un called for," Hong wrote. Early Friday, U.S. President Donald Trump cautiously welcomed the summit in a tweet: "After a furious year of missile launches and Nuclear testing, a historic meeting between North and South Korea is now taking place. Good things are happening, but only time will tell!" Trump also tweeted, "KOREAN WAR TO END! The United States, and all of its GREAT people, should be very proud of what is now taking place in Korea!" Trump and Kim are expected to meet in either late May or early June.